TV falls further behind, suffers first ad revenue decline since the Financial Crisis. You might think you never look at these ads or click on them, and you might think they’re the biggest waste of money there ever was, but reality is that internet advertising revenues in the US are surging, and are blowing all other media categories out of the water. But only two companies divvy up among themselves nearly 60% of the spoils. 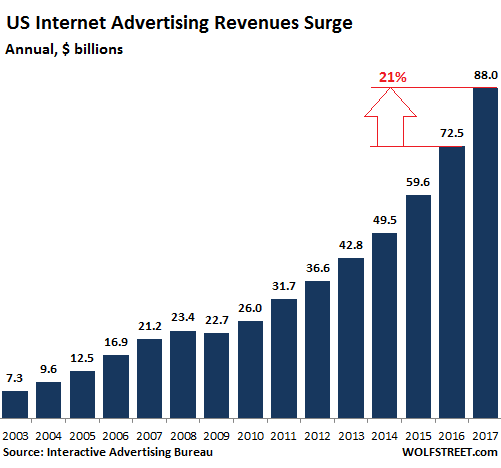 Internet advertising revenues in the US soared 21.4% in 2017 from a year earlier to a record of $88 billion, thus handily demolishing TV ad revenues, which declined 2.6% to $70.1 billion, according to annual ad revenue report by the Interactive Advertising Bureau (IAB). 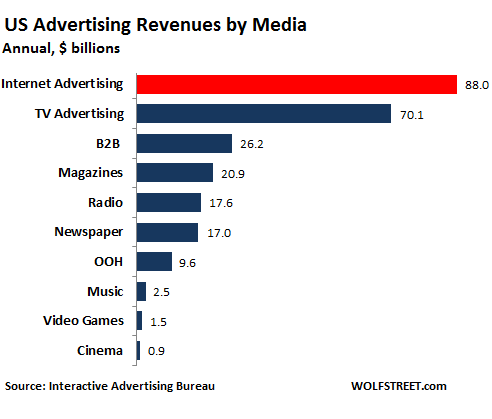 It was the second year in a row that internet ad revenues beat TV. In 2016, internet ad revenues (or “ad spend”) had surpassed TV ad revenues for the first time in US history. And 2017 was the first year in the data series going back to 2010 that TV advertising actually declined. That formerly unstoppable growth industry is now a declining industry. Why is the Internet so successful in attracting the big bucks? Current technological advances in big data, predictive analytics, artificial intelligence, and robotic process automation (RPA) have all greatly impacted the industry and will continue to do so for the foreseeable future. The volume of digital data being created on the internet is increasing exponentially. Every year the digital universe doubles in size with many estimates indicating a 50X growth between 2010 and 2020 ["Inside Big Data, Exponential Growth of Data,” February 2017]. These large volumes of data provide the raw ingredients to enable greater advertising efficiency. The ability to apply analytics and AI to massive volumes of data enable marketers to target end users in ways not previously possible. Furthermore, these same advances when combined with RPA have allowed for increased automation throughout the ecosystem – driving further efficiencies. Mobile is hot. Internet advertising on mobile devices surged 36.2% in 2017 from a year earlier to $38.1 billion of the $88 billion in total internet advertising. Search ad revenues +17.5% to $40.6 billion (46% share). Video ad revenues +33% to $11.9 billion; all of that growth came from mobile devices, up 53% to $6.2 billion; there was no growth on PCs. Other (lead generation, audio, classified, etc.) +19.2% to $8 billion. Social Media sizzles, fake news no problem. Advertising spend on social media surged 36% from the prior year to $22.2 billion, now accounting for a quarter of all internet advertising, up from just an 8% share in 2012. But who’s getting all this internet ad manna? The report is presented at an “anonymized aggregate level,” and no company names are given. But it’s not hard to figure out. The top ten companies got 74% of the share in Q4 2017, according to the report. For further detail, we mosey over to eMarketer, which estimates that in 2017, Google captured 38.6% of the total internet ad spend in the US and Facebook captured 19.9% in the US, for a combined total of 58.5% of total internet ad spend. Just by these two companies! For perspective, Google’s parent Alphabet reported global revenues of $111 billion in 2017, and Facebook $40 billion. Practically all of it was generated by internet advertising. eMarketer expects Google’s and Facebook’s respective share of total ad spend to decline slightly going forward, even as their dollar ad revenues continue to rise, but more slowly than the overall market. They’re under pressure from some newcomers and smaller giants, so to speak, and from Amazon which is muscling into this space and is expected to carve out over $2 billion in 2018, and more in 2019, providing further excitement in future years.